Kimpton Hotels aren’t just the perfect place to lay your head on vacation, or bring your dog for a visit where they’ll be pampered beyond belief at no charge; they are also one of the best options for local and crazily delicious food to be had while traveling. As a travel and sports writer, any place that is on the way to a football stadium is already an A+ in my book. A place that serves great food in a relaxed and friendly environment but also boasts a tavern feel in the midst of the Windy City – another win. While spending a long weekend in Chicago, I was able to partake in quite a few brunches, but none as good as South Water Kitchen. For travelers with a sweet tooth, be sure to try the Challah French Toast, stuffed with lemon cream cheese and blueberries, and maybe a side of eggs and bacon to help even out the savory portion of your starter meal. If you’re a coffee aficionado like me, you’ll be impressed with the fact that South Water Kitchen serves a locally roasted organic coffee from intelligentsia coffee company. For more traditional brunch go’ers, eggs benedict seem to be their thing with at least two very tasty options: traditional eggs benedict (smoked ham, hollandaise sauce and breakfast potatoes for $13) or the cake cake benedict (wilted spinach, spicy hollandaise sauce and breakfast potatoes for $15). Executive Chef Roger Waysok has made a commitment to the guests at South Water Kitchen to serve locally sourced products when available. Not only does that go an extra long way in the taste and freshness of the food (the eggs alone will amaze you! ), but it’s the sustainability and attention to his local farmers and merchants that help add to the cause and make South Water Kitchen a place you’ll want to frequent each and every time you step foot in or around Chicago. Adjacent to the hip Hotel Monaco Chicago, South Water Kitchen is pretty much walking distance or a quick and cheap cab ride from anywhere in downtown Chicago and well worth the trek. The windows that line the streets are littered with passerbys, which makes for perfect people watching and the décor inside sets the tone as a perfect conversation starter. In a bustling city like Chicago, and in the busy brunch hour that we visited South Water Kitchen, the friendliness and appreciation of our business was felt from the second we walked in. It’s those little touches that make each visit well worth it and stays true to the Kimpton name – whether in the hotel or the restaurant. Aside from the incredibly friendly staff, the sprawling bar had plenty of space for you and all your girlfriends to stop by for mimosas or a Bloody Mary (before heading to Soldier Field or good shopping). The restaurant boasts itself as a “true Chicago native,” so be sure to order your bloody mary “Chicago-style” with all the fixins’. It’s almost all vegetables anyways, so it clearly evens out the vodka consumption. 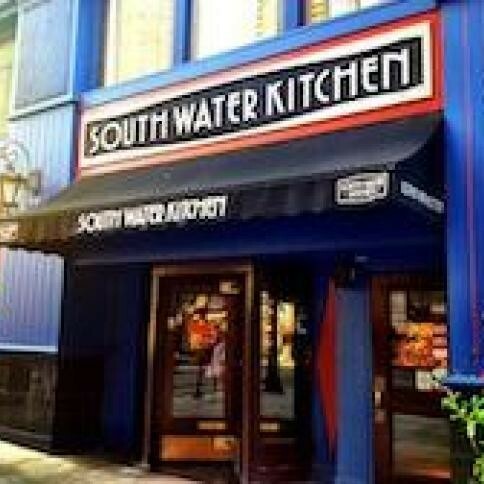 Follow South Water Kitchen on Facebook and Twitter for mouth-watering specials and events.